To accommodate the continued growth in Institute for Social Research (ISR) research activity, a 52,000 gross square foot addition to the Perry Building is being constructed. 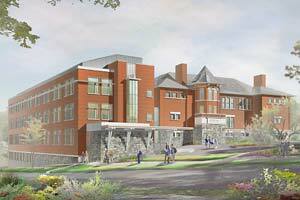 The addition will be four floors plus a penthouse for mechanical equipment. The addition will house research space for the Survey Operations unit, currently located in 39,900 square feet of rental space, and the Rackham Interdisciplinary Program in Survey Methodology currently located in the ISR Building.